These are all now in PDF File Format ... whew!! Please note: All the pictures and text in these tutorials are copyrighted to me. I provide these free of charge for your own personal use or for constructing items. If you wish to include one or two in a newsletter or on your blog, please inquire FIRST! They may not be used by anyone other than myself without written permission. I appreciate you honoring my copyright. Decorating Stitch & Starch Knit Baskets - Step by step instructions w/pictures for easily decorating any of our Vistorian style Knit & Starched Baskets. 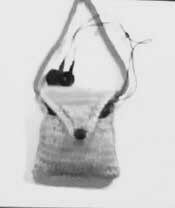 Please see our pattern book for "A Tisket A Tasket Machine Knit A Basket" in our Patterns section. Gathered Scallop Ribbing - a favorite around here, this ribbing method looks great on cuffs. It also works for leg warmers, wristlets and more. 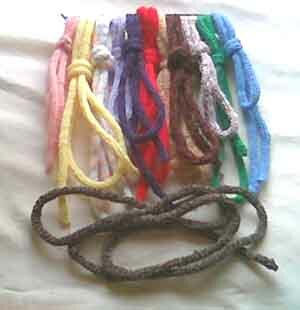 I-Cord Fun - great ideas for using that simple I-Cord. Blend it with other embellishment stitches to expand the use of your knitting machine. Mock Ribbing - basic instructions on how to create ribbing without having a ribber attachment. 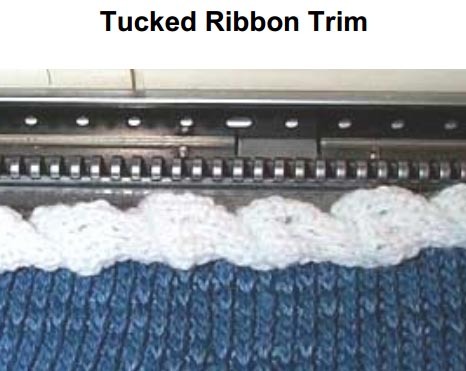 Quick Rib Neckline - this uses your ravel cord to knit sections off the machine and then add them in later. 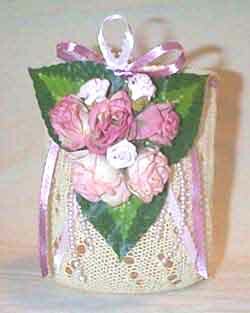 Neck Purse - an ever popular one around here, this quick to knit little neck purse adjusts to many sizes. Make the hanging loop shorter and and you can loop it over a belt. Threading The Mast - example is done with the Brother 390 Convertible and is compatible with most plastic bed hobby machines such as the LK150. V-Neck Raglan Embellishments - utilize raglan designs to create a lovely and unique neckline. Five different examples are given with a wide range of uses. Weave Cast On - Basics of doing a weave cast on. Examples are shown with a 4.5mm standard gauge knitting machine. 3 variations depending on the look you need. Changing A Sponge Strip - Short tutorial using the Brother 390 Convertible as a sample. This is compatible with most plastic bed hobby machines that use a 'strip' rather than a 'bar'. Setting Up A Tilt Stand - a few pictures of what you should receive if you purchase a used tilt-stand and how to get it all set up. Tucked Ribbon Trip - This can be done on just about any machine. Easiest if you have a HOLD button/lever capable machine. Can also be done with manually putting a needle on hold. This is a free PDF download. Embellish Knits With A Crochet Hook - Try some Chain Stitch Embroidery on your knit pieces. Great for adding initials, words and various designs. Stress Free Way To Ease In Stitches !! 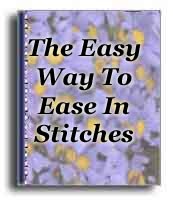 - this PDF file will teach you how to easily add stitches to your machine knitting. Also great for decreasing stitches. Oval and Octagon Pattern - How to create a 'stuffable' oval or egg shape by short-rowing your work. This is done in ONE piece! Very little sewing to be done for this quick project. This page and its content is under copyright to Margaret S. Parker of MKDesigner.com. © 1996- 2018 -- All rights reserved both foreign and domestic. No portion may be reproduced elsewhere without specific written permission. Use the EMAIL button on any page.